Finally, you can have real tickets in your hand and not only the confirmation SMS/printout of the tickets before your venture out to Railways station for your next train travel! For the first time, IRCTC (Indian Railway Catering and Tourism Corporation) is offering the CoD or Cash-on-Delivery option for railway tickets that have been booked online. We had reported about this back in August, where we had said found that IRCTC has partnered with BookMyTrain.com, a website owned and managed by Anduril Technologies. Anduril is a privately held Noida-based start up incubated under Amity Innovation Incubator. People at Anduril are primarily technocrats with experience in open source technologies. Now, millions of users, who are not very comfortable giving out their credit or debit card details online can book their tickets without worrying about their card details being compromised. Although, eCommerce has grown leaps and bounds in India, usage of credit or debit cards online still remains one of the biggest concerns for online shoppers. At the same time, there are many users who still do not have netbanking or debit card facilities and hence are unable to make purchases online! The new Cash on Delivery facility is exactly targeted at those customers! The service will be initially available in 200 cities on pilot basis and then will be spread Pan India in phased manner. How to Book Tickets using Cash on Delivery Option? 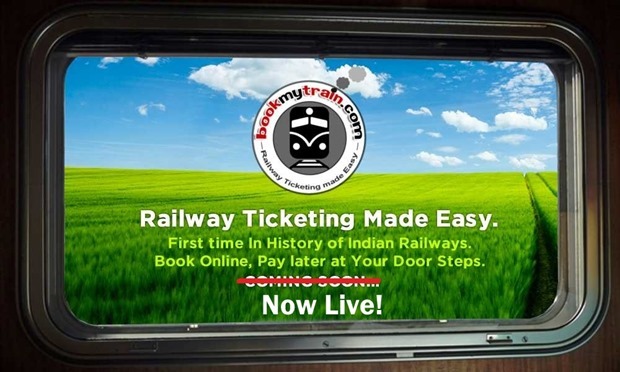 The Cash on Delivery facility is only available through IRCTC’s authorized partner website BookMyTrain.com – The facility is also available on their mobile app. Once you go through the entire ticket booking process, you will need to choose “Cash on Delivery” option. This option will only be available for tickets that are booked for journey atleast 5 days prior to the travel. Cash on Delivery will attract extra charges – For sleeper class tickets it will cost Rs. 40, while AC class tickets will be charged Rs. 60. Anduril Technologies will be responsible for the delivery of tickets, cash management and cancellations of tickets booked on BookMyTrain.com. IRCTC already sells close to 5 lakh tickets a day, however offering tickets on cash on delivery may not only reduce number of failed transactions, but also witness steep increase in the number of bookings that happen online. Currently, 42 percent people use net banking, 24% use Debit/Credit cards and rest of them use other means like prepaid cash cards to book tickets online through official IRCTC website. It is great to see IRCTC taking steps to ensure that it becomes easy for train travelers to book tickets. Last year they overhauled their entire infrastructure and increased their capacity of booking tickets from 2000 tickets to 7200 tickets a minute. IRCTC has now introduced this in their platform as a payment option aswell. You can choose COD/Pay Later option and do faster transactions.